At Whitten Metalworks we believe that when we make a security product it should be strong, secure and reliable. 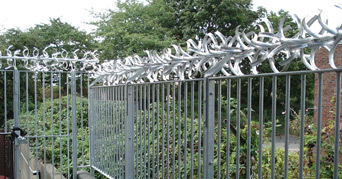 From standard off the shelf products to an item designed to suit your particular requirements the right type of secure railings, steel security fencing, grilles & gates are easy to put into place. We cater for residential clients where an aesthetically pleasing design may be more important, by incorporating various railheads, scrollwork and locks into the design, your railings can still be a deterrent to any potential intruder but also be easy on the eye.